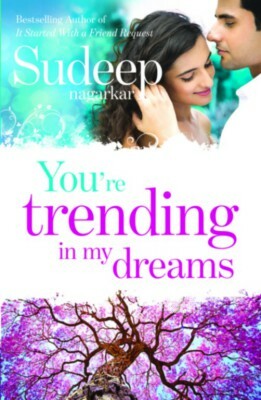 You're Trending in My Dreams is an english novel written by Sudeep Nagarkar. Four friends . . . four lives . . . one decision Four college students, who couldnt be more different from each other, move into a flat in Mumbai. While Varun is sloppy but lovable, Ahana is gutsy and reckless; Malvika is the groups selfie queen and Garima is the most reserved in the group. Yet, all four get along like a house on fire. Although each of them is battling personal demons, their commitment to the bond of friendship they have built over time holds them together. Things, however, take a turbulent turn when one of the four finds herself caught in a mess. Will they stick together or fall apart? Youre Trending in My Dreams is a true story that will reaffirm your faith in the magic of love and friendship. Sudeep Nagarkar has authored five bestselling novels - Few Things Left Unsaid (2011), Thats the Way We Met (2012), It Started with a Friend Request (2013), Sorry, Youre Not My Type (2014) and Youre The Password to My Life (2014). He is the recipient of the 2013 Youth Achievers Award and has been featured on the Forbes India longlist of the most influential celebrities. He also writes for television and has given guest lectures in various renowned institutes and organizations.